This story takes up immediately from where The Wanderer finished. It continues the story of Cooper and Sarah, Mac and Gina and their relationships with each other. Along with this there is a story line for Ashley, Gina's daughter as she negotiates some of the more difficult aspects of growing up in today's world. Ashley also finds that there is a new person in her life, someone she has not met, up until now. For Mac and his children there is also an unexpected visitor. The mother who abandoned them many years ago returns looking to reconnect with them. As well, Cooper is in for a surprise from his past. I noticed a number of reviewers on Goodreads wondering about the title, The Newcomer. Who exactly is the newcomer in this novel? 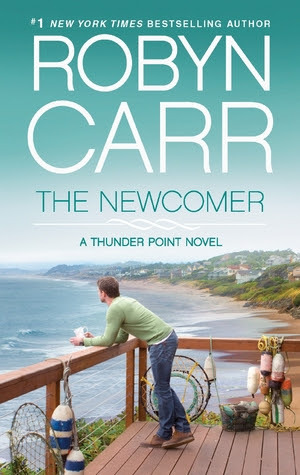 There are a number of visitors to Thunder Point, and as I read I wondered were they the newcomer. During the book the coach of the local team decides he has had enough and a new coach has to be found. Is the new coach the newcomer. On one page Mac refers to Cooper as the newcomer! Hmm. I am wondering if Cooper is the newcomer, progressing from wanderer to newcomer. Maybe he will be the hero in the next book? I shall just have to wait and see! I enjoyed reading Ashley's struggle, of all the characters in this book I believe she grew the most. She faced a challenge and overcame it, becoming all the stronger for it. Robyn Carr has highlighted a number of issues that teens face today and has explored how they may be worked through. Another character I also liked reading a little more about is Rawley the rather withdrawn worker that Cooper found at Hank's place when he arrived in The Wanderer. It is just a small snippet in the book but one I loved. I believe there is more to come in the next book for Cooper and Sarah, they still have a way to journey. I look forward to that and watching also the effect of the new coach and the son he brings with him to Thunder Point. Now I'm curious about who the newcomer actually is! Nice review.